STLN staff writer Olivia Bagg ’19 sits down with Grant Landau-Williams ’19, the director of Susan-Lori Parks’s Devotees in the Garden of Love, to learn a little bit about our first lab of the semester. OB: Why did you choose this play and why do you think it’s important to be done now? GLW: I chose this show because it gives voice—a uniquely feminine voice—to the way our society handles and perpetuates patriarchy. This is something that has, for as long as anyone can remember, plagued women and forced certain expectations upon them, as well as taught men to view women and femininity as lesser, or as a tool. It’s important that these truths be spoken about, particularly now, as the court hearings for Kavanaugh are underway. People, and specifically women, need to be heard on these issues, as they have been ignored for too long. OB: What is your definition of love? GLW: Love is something you can wholly dedicate yourself to without sacrificing yourself at all. Love builds up both participants and enriches them, be it love between two people, or love of an idea, like art. OB: I’ve read that Suzan-Lori Parks can be very unconventional in her writing. Can you speak to this? GLW: Suzan-Lori Parks writes in a vernacular that not everyone knows, and she frames things in ways that are not always linear or logical. I think it challenges the audience to really listen to the words she’s expertly crafted, and to hopefully let go of any notion of what a play “should” be. It invites the audience to go along for the ride and discern what they can from it, knowing they might not get every little thing. This way each person’s takeaway is unique to them. OB: What challenges have presented themselves as a result of her unconventional ways of writing? GLW: I think this has made table work a little challenging. It’s not clear exactly what is happening at each moment and so it can be hard to determine character motivations. We did a lot of devising, though, to hopefully capture the feeling of what is happening, rather than doing what is literally happening in the script. I think she left things open enough that we can comfortably say we’re not betraying her vision. OB: What do you hope the theater department gets out of this show? GLW: I hope that this show helps the department looks at the ways it is perpetuating patriarchy and that it will shift some of the old energy that no longer serves the students here. 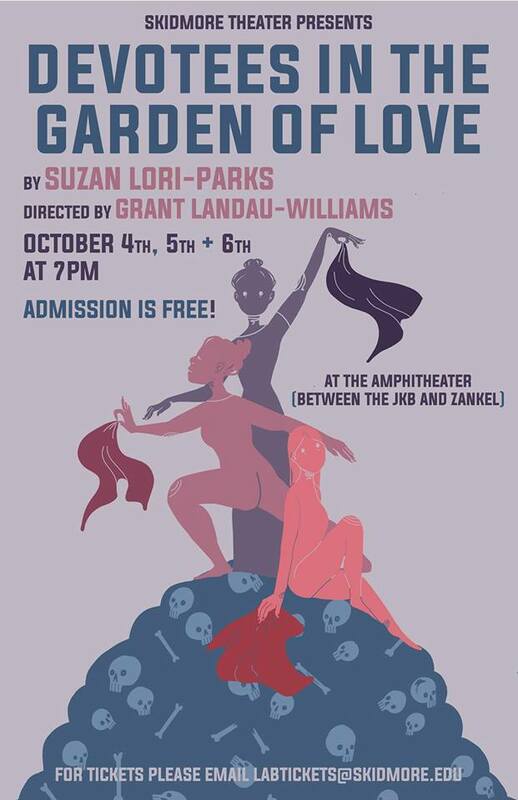 Devotees in the Garden of Love runs October 4th-6th at 7pm each night in the amphitheater between the JKB and Zankel. Admission is free! Email labtickets@skidmore.edu to confirm your attendance. Olivia Bagg is a senior theater major and staff writer for the Living Newsletter.